I see the problem. The first page shows 1 to 10 books of howevermany there are in the category but page two which should show 11 to 20 only shows one and the advance key does not work. I have reported this to Per and I am sure he will look at it as soon as he has time. This should now be fixed. It all seems OK on my laptop so please check and report back. Looks good for all filtered files - campfire, misc., etc but still wonky for the "all songbooks" option. 10 songbooks show up but at the bottom indicates "showing 1-0 of 0 public songbooks" and no way to get to other songbooks. That is strange, I do not see an 'all songbook' option. I have a 'No category' with 1144 books listed and I can see the first 5 pages of that with no problem. 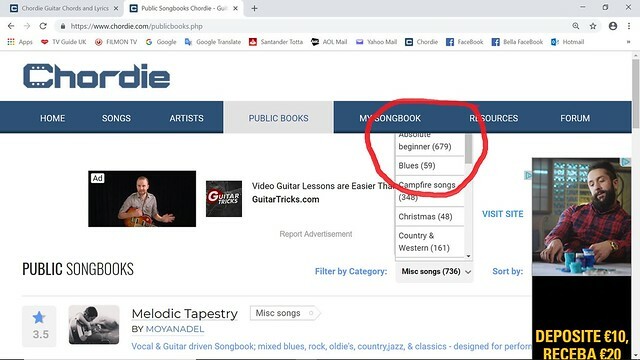 My listing starts with 'Absolute beginners' followed by 'Blues' and, as they are in alphabetical order, an 'All songbooks' should be between them. Can you show me a screenshot with the 'All songbooks' please. Hey Roger, sorry so long getting back to you. I have no idea how to get a screen shot loaded onto here. Any suggestions? 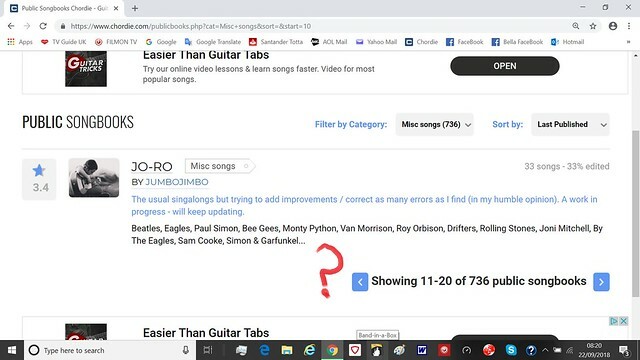 I find that to see the whole list of songbook filter options, I have to have the screen scrolled up to where the the category twistie (is that really the term?) is right at the top of the screen. I also have the No Category option. So I am not getting the full view (maybe it is my screen resolution) anyway I will drop a line to Per if you are still not abe to get all the books in All Songbooks. I don't really use the lists much but I thought it was a glitch Per might want to know about. I get the same trunchated list as you unless I scroll down as far as possible before opening the list. I am always impressed with the effort you mods put into this site. It might be a cache issue. Try reloading the page(holding shift down).